Today @therealadamsavage came to #MAKESHOP! We talked about important things like: weaving on looms, storage solutions and the great noise a #polaroid camera makes. Thanks for visiting our #makerspace, Adam! 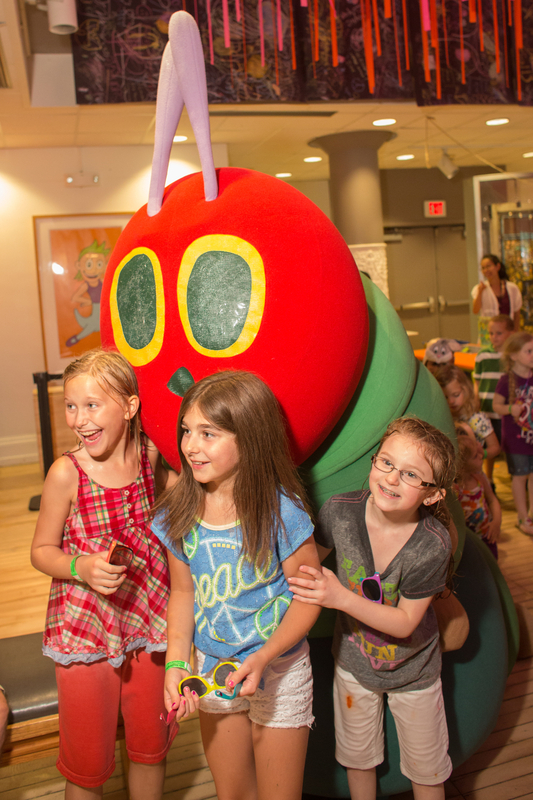 On occasion, Children’s Museum of Pittsburgh has received a visit from a familiar face, from Mr. Rogers to the Very Hungry Caterpillar. 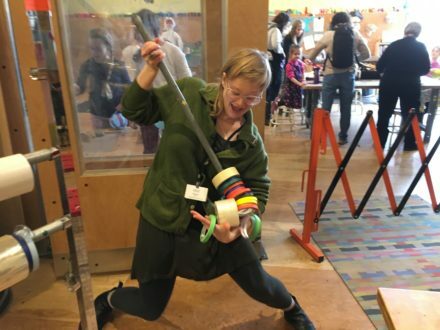 This fall, fans of the Discovery Channel television series MythBusters might have recognized a particular guest in the Children’s Museum when he came to visit MAKESHOP: Adam Savage–maker, artist, and TV host (among many other titles). During his visit, Savage highlighted a MAKESHOP staple that has generated questions and admiration from visitors of all kinds: our tape rack. I love this tape cart. I may do something similar. Spotted in a maker space in Pittsburgh. New in my shop, inspired by the rack I saw at @pghkids! 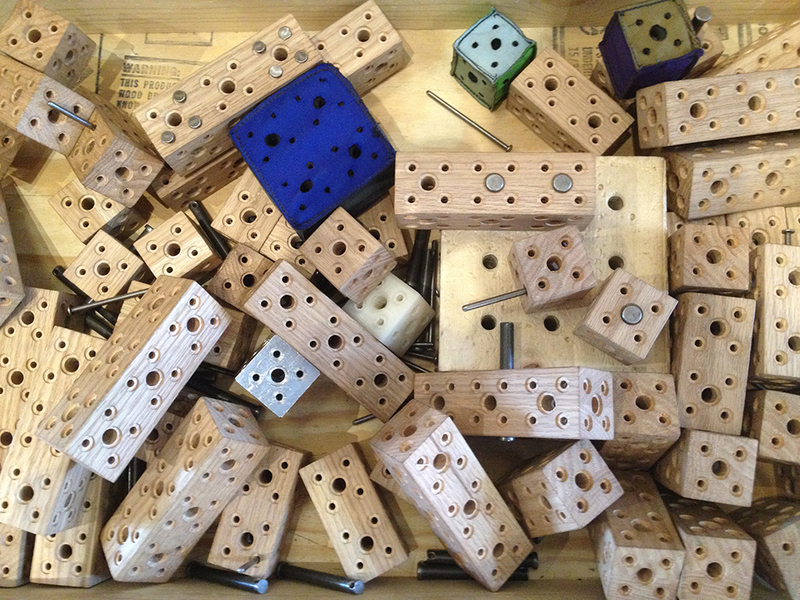 Here are answers to some frequently asked questions about our tape rack. A: It’s a metal pipe structure roughly five feet in height with horizontal rails/rods that are easily removable, and the entire structure is on wheels. Q: How do you remove a roll from the middle of the rail or replace a roll of tape? Teaching Artist Devon shows off our rolling tape dispenser. Teaching Artist Devon demonstrates the lifting technique used to remove a rail of tape for replacement. Teaching Artist Devon demonstrates the ease with which she removes the rolls of tape from the rail while Teaching Artist Colin looks on in amazement. Just be careful not to tip the rail, as it can cause a big mess! Update: Tested.com uploaded the tour video! Check out our short follow-up post here. Is there a shot he will return to the Makeshop? We missed this me my six year old would probably joyfully cry if she got to meet him. Hi, Jessica! As far as we know, this was a one-time special occasion. But you’re not alone–many visitors expressed regret that they didn’t get a chance to see him. He is scheduled to return to Pittsburgh for his March 7, 2017 performance of Brain Candy LIVE!, and we’d love to have him back at Children’s Museum of Pittsburgh (but no guarantees). You can find more information on his tour on the Brain Candy LIVE! website.